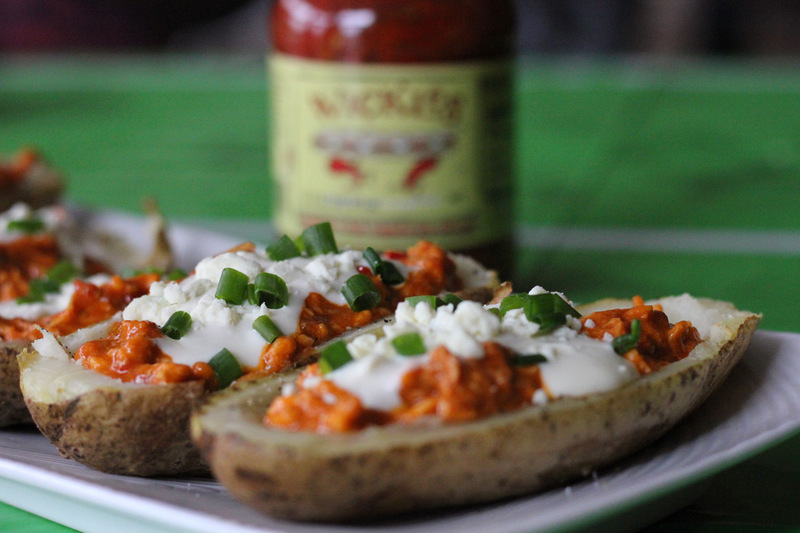 Buffalo Chicken Potato Skins with Spicy Red Sandwich Spread, need we say more? To poach the chicken combine the broth, salt, thyme and peppercorns in a high-sided frying pan or sauté pan. Make sure the broth will almost cover the chicken breasts so use a pan that is just about large enough to fit them in one layer. Bring the broth to a boil and reduce the heat to maintain a simmer. Add the chicken breasts and poach (lightly simmer – do not boil) turning once, about 15 minutes. Turn off the heat and cover the pan. Allow the chicken to rest in the broth and finish cooking for about 15 more minutes. If the breasts are large or thick, allow them to poach an extra 10 minutes or so. Remove the chicken (save about ½ cup of the broth) slice or shred as desired. Refrigerate the chicken if making ahead until ready to use. Combine 1 tablespoon canola oil with the melted butter. Brush the mixture on the inside of each potato skin. Add salt and pepper and turn them over and brush the backs of the potatoes. Place the baking sheet back in the oven and cook for about 10 minutes. Turn the potatoes over and continue cooking for about 5 minutes. Remove from the oven and set aside. While the potatoes are cooking combine the shredded chicken with the hot sauce and Spicy Red Sandwich Spread in a small saucepan. Add a little of the chicken broth to thin as needed. You want the chicken to be moist but not drippy wet. Heat on medium low until hot. 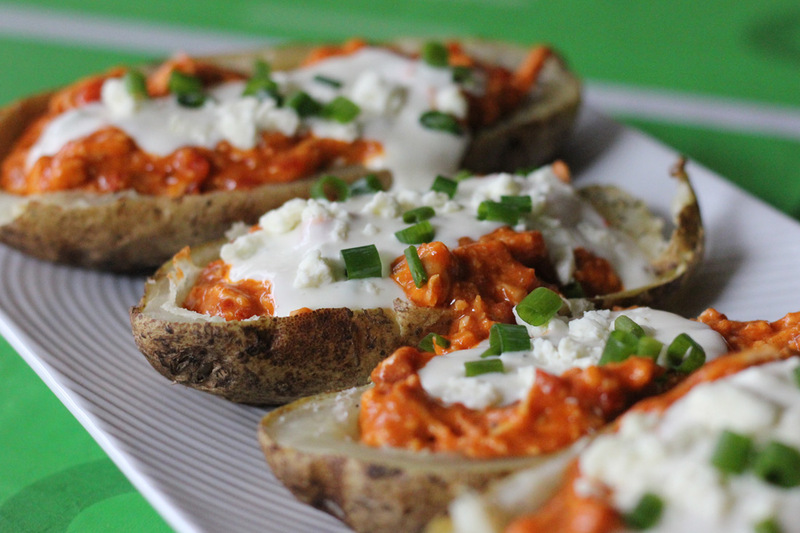 Fill each potato skin with ⅛ of the chicken, then top with a dollop of the Blue Cheese Dip, additional blue cheese crumbles and sliced green onions if desired. If you prefer top a few with cheddar cheese in place of the blue cheese. 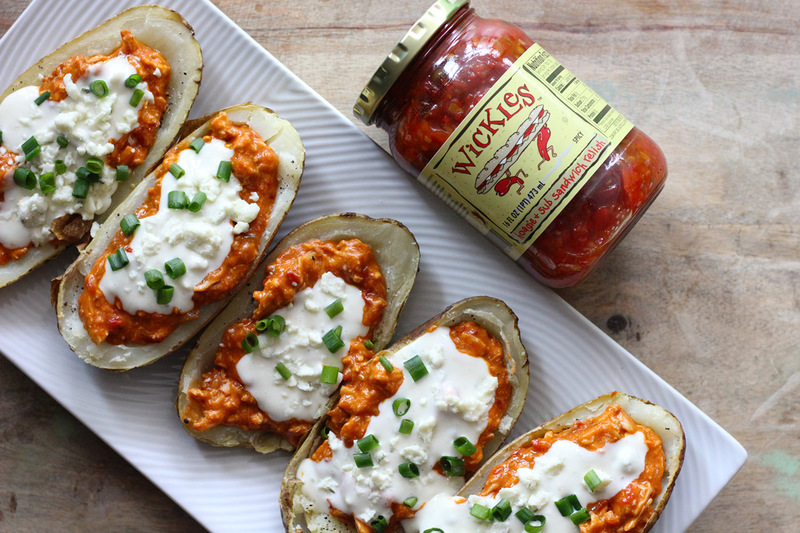 Plain sour cream goes well with the cheddar Buffalo Chicken Skins.